Diabetic Socks - Non Skid / No Slip Grip Hospital Socks,Make your steps secure with these anti skid and anti slip diabetic socks that come in a pack of 2 , Get 2 for the price of 1! Make your steps secure with these anti skid and anti slip diabetic socks that come in a pack of 2 , Get 2 for the price of 1! These anti skid and anti slip diabetic socks offer secure steps with sole treads that provide extra traction and security while you walk. The stretch of the socks is non binding that can stretch and accomodate any size without consricting the natural blood flow. Spandex on the leg and foot ensures no slip. There is a seamless toe closure that gives added comfort and reduces pressure and friction on the toes. The inside of the heel is also seamless so as to avoid any skin issues in diabetics. These diabetic socks are the best option for diabetics who are looking for best comfort and fall prevention safety. The silicone tread on these socks makes them comfortable with increased traction on smoother surfaces preventing fall. Also known as gripper socks with treads or grips. These socks are avaiable in 3 sizes. 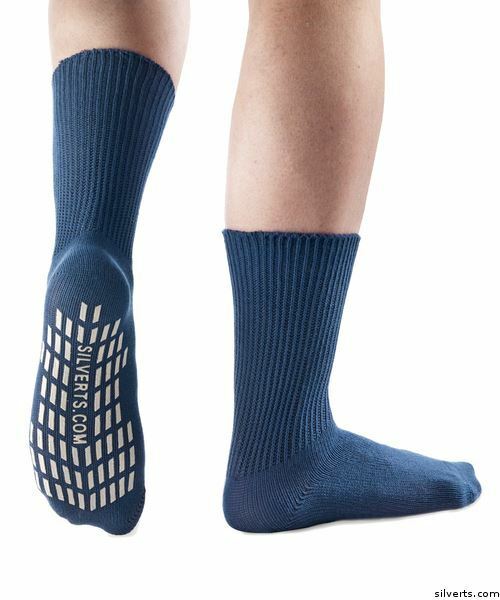 These socks are best for safe wheelchair transfers, acute care and long term care patients. They are the best bet for hospital patients, post surgery, nursing and retirement homes. These men and women anti skid gripper socks are also used in fall prevention programs. They also make the best choice for home use. These non slip resistant slipper socks are used as lounge, tread and sleep socks due to their comfort level.